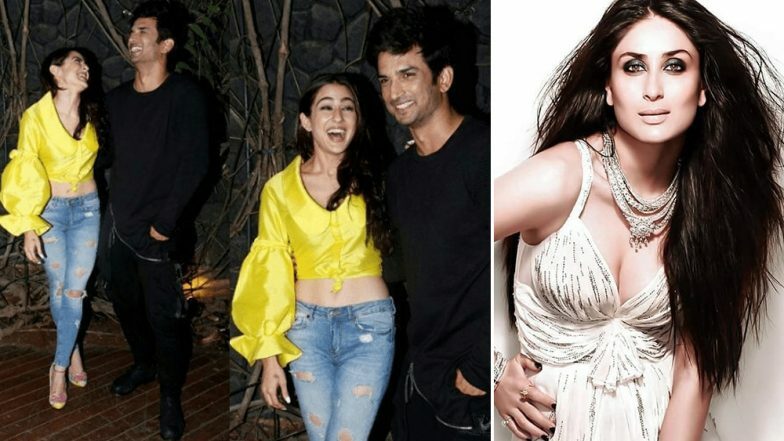 Did Kareena Kapoor Khan Just Confirm Sara Ali Khan's Rumoured Relationship With Sushant Singh Rajput? Sara Ali Khan has been the talk of the town since before her debut film even released and now the two-film-old actress is already becoming a media favourite thanks to her lively personality. Sara's frankness has been lauded by many and most of all it turned out to be the most entertaining when she sat on the Koffee With Karan couch. The Kedarnath actress openly made a comment on wanting to date Kartik Aaryan and ever since, her dating life has been hitting the headlines. Recently, her step-mother, Kareena Kapoor Khan too made a remark on Sara's dating history and that may have given way for some new gossip. Kareena Kapoor Khan and her bestie Amrita Arora Ladak recently came together for a talk show. In one segment of their interactions on the show, Kareena has to answer some questions and among them, one question was about her step-daughter Sara Ali Khan. The question was "What dating advise would you give to Sara Ali Khan? ".To this, Kareena replied, "Don't date your first hero." Like Kareena Kapoor Khan, Step-Daughter Sara Ali Khan Is Also a Pilates Girl, View Pics Inside. Well, this certainly came as surprise to many because it was a big enough hint that Sara's first co-star was none other than Sushant Singh Rajput. Rumours about Sara and Sushant's relationship was being speculated for long and now with Kareena's comment, it was definitely confirmed. In the past, Sara and Sushant have been spotted outside each other's houses and Sarah even managed to make it in the city especially for Sushant's birthday although, the two never admitted to their relationship. There were even reports of the couple asking paparazzi to delete their pictures. Looks like we may get to see more such secrets revealed once Kareena Kapoor Khan takes the coffee couch with Priyanka Chopra on the Koffee With Karan season finale.